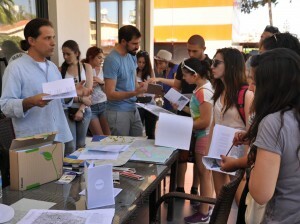 The workshop was participated by volunteers and students as well as experts and young graduates of architecture to transforming controversies for the city into design challenges. Material produced at this workshop became part of the web platform. We define controversies as turning points during urban design / planning processes when conflictual points of views coming from the project actors involved, are negotiated by the assembly of actors. During the negotiation the points of views may be readjusted by a collective decision process that may include the creation of additional points of views, may cause their turning down or their support by other actors, or even their modification. In some cases additional project actors may be introduced into such assembly. 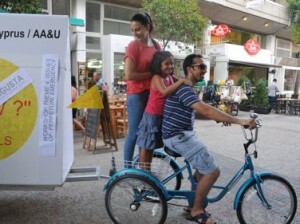 A mobile exhibition infrastructure was provided by the Laboratory of Urbanism University of Cyprus (LU2CY) to support the workshops in Nicosia. Have you seen our energetic workshop participants sporting with tricycles while promoting the project on Ledra? 40 volunteers from both communities were divided in groups of two to three people both Greek Cypriots and Turkish Cypriots and were assigned specific areas of the city to survey. They were given printed maps of the city in A3 format on which they documented the existing buildings, their use and their height. The GC volunteers were going to Famagusta every morning by bus and returning back in the evening. Due to the inaccessibility of the fenced off part of the city, satellite images were used by the team to update the maps and have them ready for digitilization.